The large amount of starch in a russet potato makes it the perfect choice for baking. Unfortunately, the high percentage of starch is a downside if you need to keep your blood sugar balanced or you're watching calories. As long as you enjoy them in moderation, russet potatoes are a good source of fiber, vitamins and minerals, especially vitamin B-6 and potassium. Starchy vegetables, such as russet potatoes, contain three times more starch than other veggies, according to University of Idaho. As a complex carbohydrate, starch is a good source of energy. Consuming too much starch at one time, however, causes an unhealthy surge of sugar into your bloodstream. Russet potatoes can cause a spike in blood sugar equal to the impact of pure sugar. One medium, baked russet potato has 168 fat-free calories and 37 grams of total carbohydrates, or almost one-third of the recommended daily intake of carbs. You'll also get 4 grams of fiber, or at least 11 percent of the RDA for fiber. Like most nutrients, vitamin B-6 fills diverse roles. It helps produce energy and healthy red blood cells. A deficiency of vitamin B-6 weakens your immune system because it's used to make white blood cells that fight bacteria and produce antibodies, according to the Linus Pauling Institute. Vitamin B-6 is also needed to synthesize serotonin, a neurotransmitter that regulates moods and sleep cycles. One medium-sized, baked russet potato contains 0.6 milligrams of vitamin B-6, which fills almost half of your recommended dietary allowance. Potassium serves as one of the electrolytes your body uses to electrically stimulate muscles and nerves. It also helps lower your blood pressure through two actions: It relaxes muscles in blood vessels, and it tells the kidneys to eliminate excess sodium, which offsets sodium's ability to raise blood pressure. It's important to include good sources of potassium in your diet because most Americans only consume about half of the recommended intake, according to the U.S. Department of Agriculture. One medium russet potato contains 952 milligrams, or 20 percent of the adequate intake for potassium. One medium-sized russet potato provides 14 milligrams of vitamin C, an amount that represents 19 percent of women's recommended dietary allowance and 16 percent of men's. As an antioxidant, vitamin C neutralizes free radicals before they can damage cells. Your body also depends on it to synthesize collagen. Collagen is the connective tissue used to heal wounds and to give strength and support to your skin, bones, tendons and blood vessels. Beyond its well-known role of carrying oxygen in red blood cells, iron is also essential for synthesizing energy and DNA. In the form of myoglobin, it stores oxygen in your muscles so that it's readily available when you exercise. If you participate in intense exercise or sports, you may need up to 30 percent more iron, according to the Linus Pauling Institute. 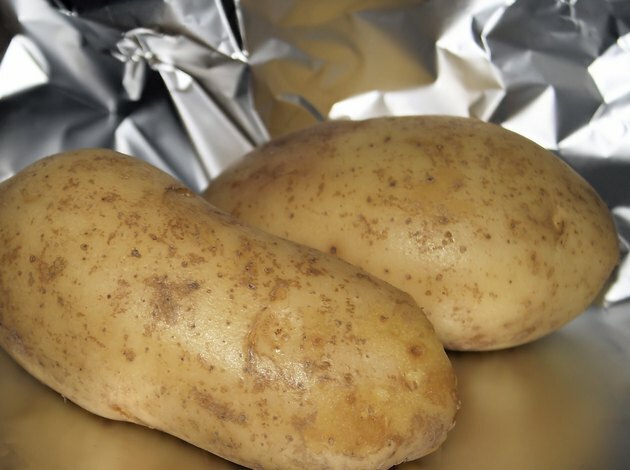 You'll get 1.85 milligrams from one baked russet potato. Premenopausal women need 18 milligrams daily, while men and post-menopausal women should consume 8 milligrams every day.